This year’s Good Vibes Festival 2018 will return in August features more contemporary headliners, bigger food village, and more tantalizing activities. 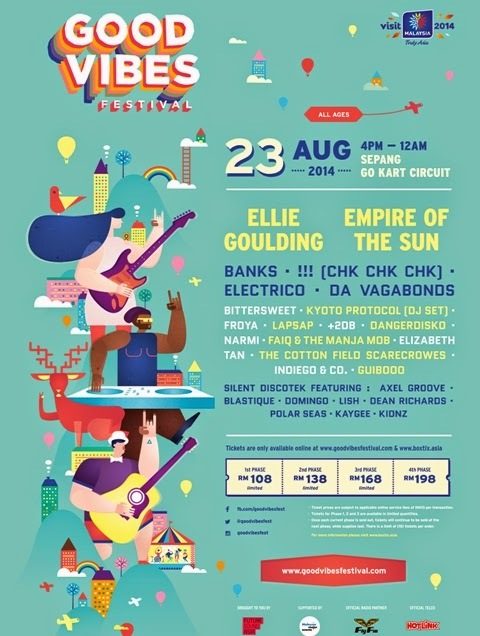 Headlining the festival, set for 23 August 2014 at Sepang Go Kart Circuit; Future Sound Asia just announced the line up are: Ellie Goulding - Anything Could Happen, Burn; Empire of the Sun - Walking on a Dream, We Are the People; Empire of the Sun - Fall Over, Before I Ever Met You; and Chk Chk Chk - Must Be the Moon, Slyd. #GoodVibesFest will also feature a formidable cohort of local and regional acts ranging from tastemaker DJs, bands, to singer-songwriters. The acts include Electrico (Singapore), Da Vagabonds, Bittersweet, Kyoto Protocol (DJ Set), Froya, +2DB, Dangerdisko, Narmi, Faiq and the Manja Mob, The Cotton Field Scarecrowes, Youtube sensation Elizabeth Tan, Lapsap, Indiego & Co and Guibooo. Good Vibes Festival 2014 is a celebration of great music, positivity, and creativity. The Sepang Go Kart Circuit will be transformed into a lively outdoor landscape for a regional audience with discerning tastes for music, art and food. In between catching their favourite acts festival-goers of all ages will be tempted to explore art installations, a food village and also exciting new festival activities to fire up the senses. GoodVibesFest is expected to attract festival goers from Singapore, Thailand, Indonesia, and the Philippines. Malaysia’s music festival for all ages, Good Vibes Festival! Tickets for the festival this year will be sold in phases with prices getting progressively higher as the festival date approaches. Tickets will be sold online only. They can be purchased at www.goodvibesfestival.com and www.boxtix.asia.